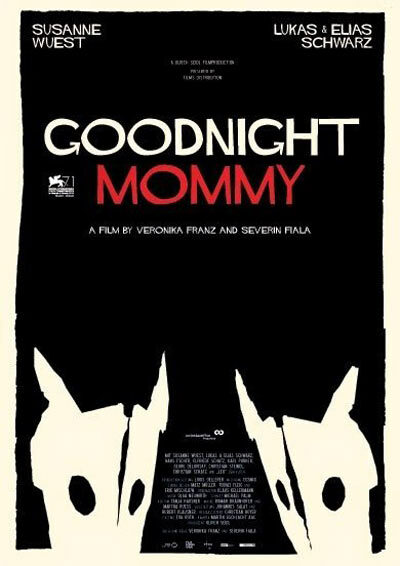 A psychological thriller from co-writers/directors Veronika Franz and Severin Fiala, GOODNIGHT MOMMY is about ten year old twin boys (Elias and Lukas Schwartz, playing characters of the same first names) who don’t believe that their mother (Suzanne Wuest) is really their mother. Mom has recently returned home after undergoing some kind of surgery that left her face fully bandaged, so we can understand she might not be feeling completely herself., But as her behavior towards the children grows increasingly harsh and strange, the most extreme example being her refusal to talk to Lukas or even acknowledge his presence, we can’t help but share the twins’ apprehensions. A photo the boys find of their mother with another identically dressed woman gives further fuel to their (and the audience’s) suspicions. Still, Mom continues to maintain that she is who she says she is. Seeing no other way to get to the truth, the kids tie mom to her bed and proceed to interrogate her in a manner that even Jack Bauer might find a bit harsh. At this point, we in the audience are forced to question our initial sympathies and assumptions. The film skillfully toys with viewers, and even if one guesses its shocking and heartbreaking secrets before they are revealed, it still packs considerable punch. GOODNIGHT MOMMY always seems at a distance from its characters, exuding a cold, dispassionate atmosphere as it slowly but steadily ratchets up the tension. Even when the kids are playing outside, or leave home altogether looking for help from the local parish priest (Hans Escher), it feels heavily claustrophobic, adding to the sense that there’s no way out for these characters. Or at least no good way out. 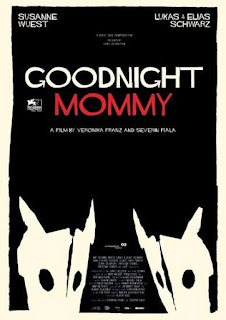 Thanks to a highly effective trailer, GOODNIGHT MOMMY has created a bit of a buzz, something not easy to do for a foreign language film in the U.S. Of course that can cut both ways, and the expectations the trailer seems to raise by selling the film as being a super scary horror film may wind up hurting it. It’s certainly unsettling and disturbing, and there are a few scenes that will likely deliver that frisson that horror fans crave, but this is also very much a serious drama. If you go into GOODNIGHT MOMMY expecting the same kinds of thrills and chills you’d get out of a slasher film or the latest INSIDIOUS or PARANORMAL ACTIVITY sequel, you will be hugely disappointed. Taken on its own terms, however, GOODNIGHT MOMMY is very nearly a masterpiece, yet another first rate horror (or horrir-ish) film in a year that has been an especially good one for the genre. 3 ½ out of 4 stars.